Gyroscopes allow you to detect orientation by detecting linear forces on a rotating element. They are used in everything from spacecraft to submarines. The device has many origins dating back to antiquity. But the modern gyro showed up around 1800 or so. The children’s toy appeared in 1917 and is still made today. There’s a school of thought that says complexity has an inversely proportional relation to reliability. In other words, the smarter you try to make something, the more likely it is to end up failing for a dumb reason. As a totally random example: you’re trying to write up a post for a popular hacking blog, all the while yelling repeatedly for your Echo Dot to turn on the fan sitting three feet away from you. It’s plugged into a WeMo Smart Plug, so you can’t even reach over and turn it on manually. You just keep repeating the same thing over and over in the sweltering July heat, hoping your virtual assistant eventually gets the hint. You know, something like that. That exact scenario definitely has never happened to anyone in the employ of this website. So it should come as no surprise that the more sensors we pack into devices, the more potential avenues of failure we open up. [Julio Della Flora] writes in to tell us of some interesting experiments he’s been performing with the MEMS gyroscope in his Xiaomi MI5S Plus smartphone. He’s found that with a function generator and a standard speaker, he’s able to induce false sensor readings. Now it should be said, [Julio] is not claiming to be the first person to discover that ultrasonic sound can confuse MEMS gyroscopes and accelerometers. At Black Hat 2017, a talk was given in which a “Sonic Gun” was used to do things like knock over self-balancing robots using the same principle. 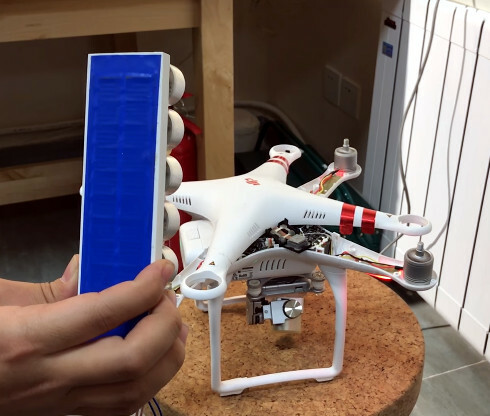 The researchers were also able to confuse a DJI Phantom drone, showing that the technique has the potential to be weaponized in the real-world. It’s interesting to see more validation that not only is this a continuing issue with consumer devices, but that it doesn’t necessarily take expensive or exotic hardware to execute. Yet another reason to take ultrasound seriously as a potential threat. Leave it to engineering students to redefine partying. [Hyun], [Justin], and [Daniel] have done exactly that for their final project by building a virtually-controlled robotic arm that plays beer pong. There are two main parts to this build: a sleeve worn by the user, and the robotic arm itself. The sleeve has IMUs at the elbow and wrist and a PIC32 that calculates their respective angles. The sleeve sends angle data to a second PIC32 where it is translated it into PWM signals and sent to the arm. There’s a pressure sensor wired sleeve-side that’s worn between forefinger and thumb and functions as a release mechanism. You don’t actually have to fling your forearm forward to get the robot to throw, but you can if you want to. The arm itself is built from three micro servos and mounted for stability. The spoon was a compromise. They tried for a while to mimic fingers, but didn’t have enough time to implement grasping and releasing on top of everything else. Initially, the team wanted wireless communication between the sleeve and the arm. They got it to work with a pair of XBees, but found that RF was only good for short periods of use. Communication is much smoother over UART, which you can see in the video below. You don’t have to have a machine shop or even a 3-D printer to build a robot arm. Here’s another bot made from scrap wood whose sole purpose is to dunk tea bags. For the millions of people suffering from Parkinson’s and other causes of hand tremor, there is new hope in the form of [mohammedzeeshan77]’s entry into the Hackaday Prize: a glove that analyzes and controls the tremors. The glove uses an accelerometer and a pair of flex sensors to determine the position of the hand as it oscillates. A Particle Photon crunches the raw data to come up with the frequency and amplitude of the tremors and uploads it to the cloud for retrieval and analysis by medical staff. Hand tremors can vary in frequency and severity depending on the cause. Some are barely perceptible movements, and others are life-disrupting shakes. By analyzing the frequency and amplitude of these tremors, doctors can better understand a patient’s condition. The best part of this glove is that it also provides immediate relief to the wearer by stabilizing the hand. A rapidly spinning super precision gyroscope counteracts the tremor oscillations as it tries to maintain its position. The last time we saw innovation like this, it came with a set of attachments. With interest and accessibility to both wearable tech and virtual reality approaching an all-time high, three students from Cornell University — [Daryl Sew, Emma Wang, and Zachary Zimmerman] — seek to turn your body into the perfect controller. That is the end goal, at least. Their prototype consists of three Kionix tri-axis accelerometer, gyroscope and magnetometer sensors (at the hand, elbow, and shoulder) to trace the arm’s movement. Relying on a PC to do most of the computational heavy lifting, a PIC32 in a t-shirt canister — hey, it’s a prototype! — receives data from the three joint positions, transmitting them to said PC via serial, which renders a useable 3D model in a virtual environment. After a brief calibration, the setup tracks the arm movement with only a little drift in readings over a few minutes.